Your company’s new circuit board does not work, and it’s your job to find out why. Where do you start? First, remember the best advice in solving a problem is to cut it in half, and then cut that in half. By cutting your problem in half, you will constantly reduce the size of the problem and more easily determine where the actual fault lies. A useful trick is to consider building two PCBs. The second PCB can be tested and compared to the original circuit board. If both boards have the same problem, then it’s a design fault in either the PCB layout or the circuit. If the second PCB works you have a bad PCB, a faulty component or an assembly defect in the first circuit. Inspect both boards carefully going over each solder joint and part. Also check the direction of diodes and large caps or any component that has polarity. To cut the problem in half, have your PCB design personnel do a thorough net comparison between the designed circuit drawing to the actual PCB Gerbers. Test the PCB, or at a minimum the problem area, with an ohmmeter and check the circuit drawing so you can say with confidence that the PCB is correct as far as trace/via connections. Use a yellow marker on the circuit drawing and identify each correct connection (this will help eliminate confusion). One of the most difficult faults are intermittent ones where the circuit works, then stops. A can of Freeze-It will pinpoint a bad via or interboard connection or even a bad component. Your second test PCB can help. If it works, then the intermittent board is a PCB fault. Freeze each small section of the board with the spray. It will pinpoint the area quickly by either causing the circuit to work or fail. You can also use Freeze-It on the chips and components to find intermittent problems. There are many hidden electrical problems within a PCB of which you may not be aware. The problems that can cause faults on an operation circuit are numerous and not necessarily caught by the PCB shops electrical testing. Wicking of the electroless solution after drilling causes high resistance shorts between vias and close traces. There is no cure; the boards are garbage. Inner-layer intermittent shorts are created when thin prepreg is used, and a copper sliver off a trace penetrates the prepreg, shorting an upper trace to a lower one. A sliver short scenario can also happen during solder mask where an overhanging trace breaks off and shorts to an adjacent trace that is then epoxied in place by the solder mask. Wrong impedance is a tough one to find at the test bench. PCB manufacturers use an off the panel coupon, located along the side of the PCB panel to measure the impedance of a set of predetermined trace widths and spacing. A time domain reflectometer (TDR) will at least show a particular trace impedance on the actual circuit. However, it may be hard to relate that to the PCB test coupon. Conductive anodic filament (CAF), growth only appears after the circuit is powered up and usually takes a few days to weeks to rear its ugly head. The DC power sets up a small plating tank when moisture is present. If your circuit worked and then stopped, look for little tree branch-like shorts that grew between DC traces. Once you have eliminated the PCB as the potential problem, your next step is to look for power supply noise. An oscilloscope will show noise. Move the probes around and check the power right at the chip V ++ or solder on bypass capacitors right to the chip power and ground to see if it fixes the problem. Keep soldering bypass caps to the board to find a noise problem. Ball grid array (BGA) devices are one such component that benefit from having the bypass capacitors on the bottom of the board, close to the power and ground leads. If your problem takes a bit of time to show up, look for thermal issues. A low-cost IR thermal temperature meter will spot if a chip or trace is overheating. Replace the chip and retest. If the problem still persists, look at the parts that were used by the initial designer. Make sure that you have not substituted a part that is not quite the same. This is one good reason to keep the layup peg board that the initial engineer used. You should be able to scope various signals and clocks between the two circuits and find, or at least understand, the problem. Check values, manufacturer part numbers and date codes on the physical components. 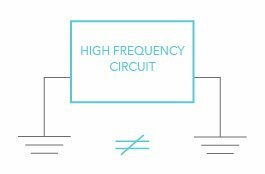 Grounding can be a major reason a new circuit does not work, especially when you’re processing high-speed circuits and tricky clock signals with high power switching. Running wires from grounds to other chip grounds at various points can show you where your signals are going wrong. Ringing and noise can be a major problem when you don’t have the grounds right. Of course, the obvious thing to look for on power systems is correct connections with low resistance. 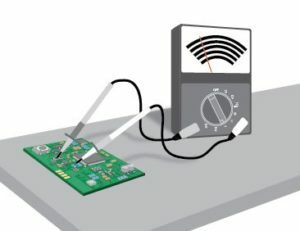 A trick is to measure the voltage across a connection by placing one lead on the wire and one lead on the screw terminal. You should have almost 0 millivolts. Any voltage across the contact will be indicative of a current loss causing measurable voltage.